December 18th, 2015, Charlottetown – P.E.I. short track speed skaters closed their 2015 competitive campaigns on a pair of fronts recently, picking up podium finishes, new provincial records and numerous new personal best times. 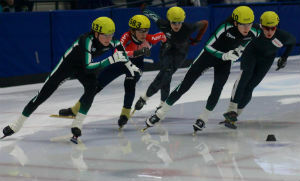 Sixteen members of the Island team were at the Charles Gorman Memorial Speed Skating Championships in Saint John, while two of P.E.I.’s top speed skaters were in Trois Rivieres, QC to compete in a Quebec Provincial circuit meet. Peter McQuaid (left) and Andrew McQuaid (second from right) grabbed a pair of top 10 finishes for P.E.I. at a recent short-track speed skating meet in Trois Rivieres, Quebec. Photo courtesy of Kristen Binns. Charlottetown siblings and 2015 Canada Winter Games veterans Andrew and Peter McQuaid had some of their best performances of 2015 against a deep field in Quebec. Peter McQuaid placed 5th in a strong Group 2, while brother Andrew grabbed 9th. Peter McQuaid posted new personal best times in both his 500m and 1000m events, coming within a quarter second of eclipsing Scott Beamish’s 2009 PEI record for junior men in the 1000m. Andrew McQuaid notched a pair of seasonal bests, mere hundredths of a second from his lifetime PB times. In Saint John, the P.E.I. contingent grabbed five medals, led by gold medal wins from Jenna Larter (Division 4) and Liam Chatfield (Division 5). Larter, of Cornwall, won both of her sprint events en route to her division title, her second gold medal in as many outings this season. Chatfield took top spot in three of his four events to bring home the gold medal, the first of the season for the Charlottetown native. Also winning medals for P.E.I. in Saint John were Carter Bruce with a silver (Division 4), Andrew Binns with a bronze (Division 2) and Kristen Binns also with bronze (Division 3). Andrew Binns shaved time from his own provincial record for 12 year-old boys in the 200m distance to secure his third podium finish in three meets this season. Bruce also made his third successive podium appearance, with PBs in all three of his timed distances. Kristen Binns earned her second medal of the season after a new PB in her 400m event. Rob Binns was P.E.I.’s lone Division 1 representative in Saint John, where he smashed a pair of his own provincial Masters records in the 1000m and 1500m distances. Also competing for the Island team in the New Brunswick meet were William Lyons of the Eastern Kings Speed Skating Club, Kyle Connell, Thomas McQuaid, Eliana Monthony, Mia Stewart, Alex Rogers, Addison Bruce, Zachary Chatfield, Olivia Wood and Jane Bruce. Eight members of the P.E.I. team in Saint John are among Island hopefuls vying for a chance to represent the Island at the Canada East Short Track Championships being hosted in Charlottetown on March 26 & 27. Saint John club members Will Oliver and Simone Hebert claimed the top overall titles for male and female skaters at the meet, which featured 124 skaters from nine Maritime clubs.